1964-1968 MUSTANG AND 1967-1968 COUGAR WINDSHIELD SHADED CLASSIC FORD CARLITE LOGO !!! OEM FOR YOUR CLASSIC MUSCLE CAR. 1964-73 MUSTANG DOOR PANELS ALL TYPES MADE IN THE USA PAIR. BEST QUALITY AVAILABLE. 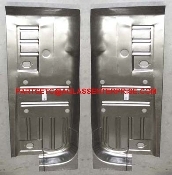 1964-73 Full Floor Pan (Full Length) CHOICE RIGHT OR LEFT SIDE Best floor pans on the market. 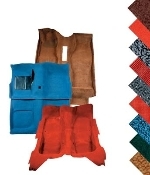 1964-73 MUSTANG UPHOLSTERY SEAT COVER SETS (MANY OPTIONS) ALL OEM COLORS , STYLES, PATTERNS, AS ORIGINAL. CUSTOM AS WELL. CHOOSE THE YEAR, MODEL, AND COLORS FROM OUR OPTIONS LIST FOR YOUR APPLICATION. 1964-73 Sound Deadener Kit / CPE CONV FSTBK All made with die cut precision that makes them easy to install. Drastically reduces road noise and helps insulate your car from the heat and cold. NEW PAIR OF LICENSE PLATE FRAMES FOR YOUR 1965 -73 MUSTANG. 1965-68 Mustang fastback rear seat molding set. Complete 13 piece set to complete your restoration. 64-66 Basic Repaint Kit ......BEST KIT AVAILABLE WHEN DOING A REPAINT. INCLUDES COMMON PARTS REPLACED. BEST VALUE! GREAT UPGRADE FOR YOUR CLASSIC CARS OR TRUCKS RETRACTABLE 3 POINT SEAT BELTS.